Australia lost a champion of Aboriginal rights, musician and pioneering film-maker with the death of Essie Coffey, OAM, on 3 January 1998. Mrs Coffey was born Essieina Goodgabah in 1942 near Goodoonga in Northern NSW. Of the Murawarri people of north-western NSW and southern Queensland, Mrs Coffey was christened Essieina  "flower of the honey tree"  but was better known as the Bush Queen of Brewarrina. Her upbringing reflects the history of suffering, deprivation and dispossession of generations of Aboriginal people forcibly rounded up and removed from their homelands and interned on reserves. It left an indelible mark on her memory, fuelling in her the spirit to stand up and speak out in defence of her people. Her father, Donald Goodgabah, a Murrawarri elder, took his young family to raise in the bush, which provided Essie with her love of the land and her strong and proud sense of identity. She spent her early life travelling from station to station with her family, working at ringbarking, fencing, woodcutting, droving and breaking in wild horses. After marrying, she settled on the banks of the Barwon River in Bre-warrina in the mid-1950s with her husband Albert "Doc" Coffey, raising eight children and adopting ten more. Living on the reserve, Mrs Coffey became a tireless worker and campaigner for her people. In the 1960s Mrs Coffey, Tombo Winters and Steve Gordon, now an ATSIC Commissioner, established the Aboriginal Movement in Brewarrina. Commissioner Gordon, who worked for more than 30 years with the Bush Queen, recalled her insatiable drive. "I believe that because Essie saw our people rounded up on the back of trucks and sent to reserves, she was committed to see change during her lifetime. We established the Aboriginal Movement in Brewarrina for this very purpose. "Essie paved the way by always fighting discrimination head on. Essie took the RSL to court and won the right to be admitted not only for herself but for all of us," Mr Gordon said. She had a very clear vision for Aboriginal communities and was instrumental in establishing and working with other significant organisations which advanced basic living conditions and protected the rights of Aboriginal people. In the 1960s and 70s she worked in the health and legal service fields and went on to be appointed to the NSW Lands Trust and the NSW Advisory Council. She also supervised the Community Development Employment Project in Brewarrina, was a member of the Wakamurra ATSIC Regional Council, co-founder of the Aboriginal Heritage and Culture Museum of Brewarrina, and served on the first National Council for Aboriginal Reconciliation in 1991. She was also a member and co-founder of the Western Aboriginal Legal Service. In 1988 she presented Queen Elizabeth with a copy of her film, My Survival as an Aboriginal, at the opening of the new Parliament House in Canberra. The film, which was made in 1978 and won national and international recognition, documents the effect of dispossession, the chronic depression, alcoholism, deaths in custody and poverty that was so much a part of life for Aboriginal people. In 1993 a sequel followed, My Life as I Live It, which also received national acclaim. Mrs Coffey was awarded the Order of Australia Medal in 1985, after refusing an MBE. She had said she was "an Australian and not a member of the British Empire". Commissioner Gordon honoured Mrs Coffeys memory and achievements. "It brings great sadness to think that the mighty Bush Queen is no longer with us. At the same time I am filled with pride and joy when reflecting on her life. 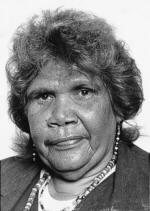 "Essies amazing presence and commitment had a profound influence in the struggle for Aboriginal rights and equality. Essie was indeed a rare flower and the memory of her sweet fragrance will continue to drive us forward."